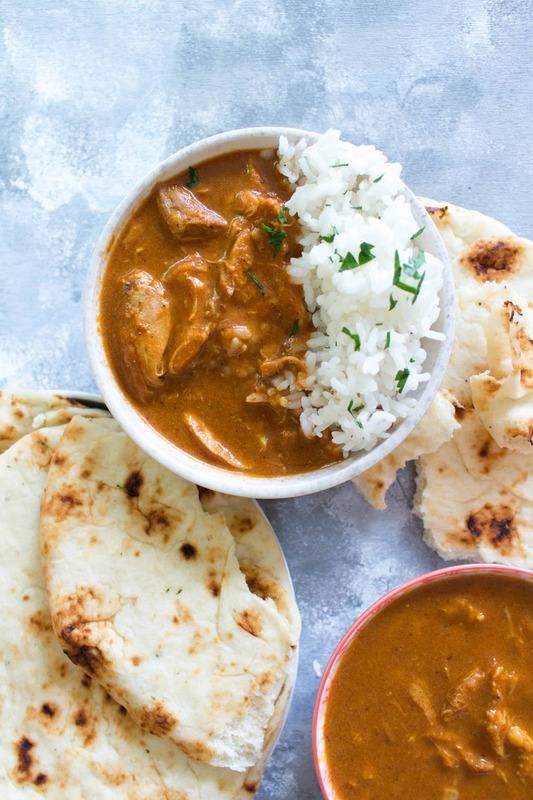 Butter chicken… my go-to comfort food but it can take a while to cook. 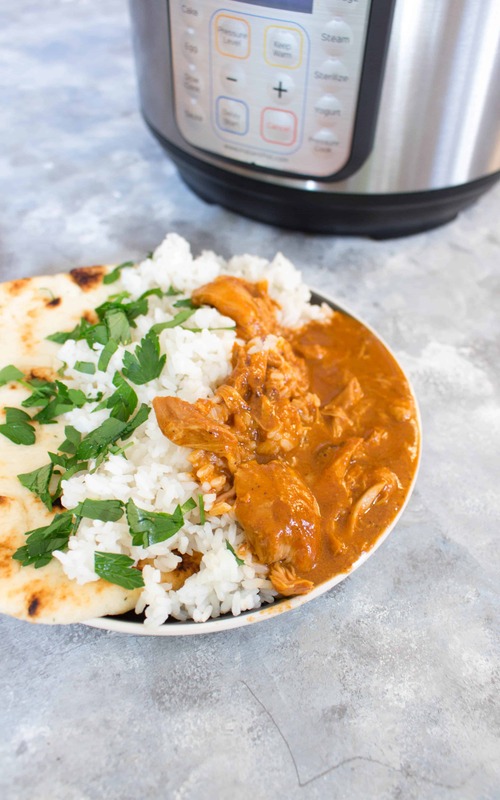 This Healthy Instant Pot Butter Chicken is a lightened up version that takes less than 30 minutes to make and is still rich and creamy. Whole30 option available! 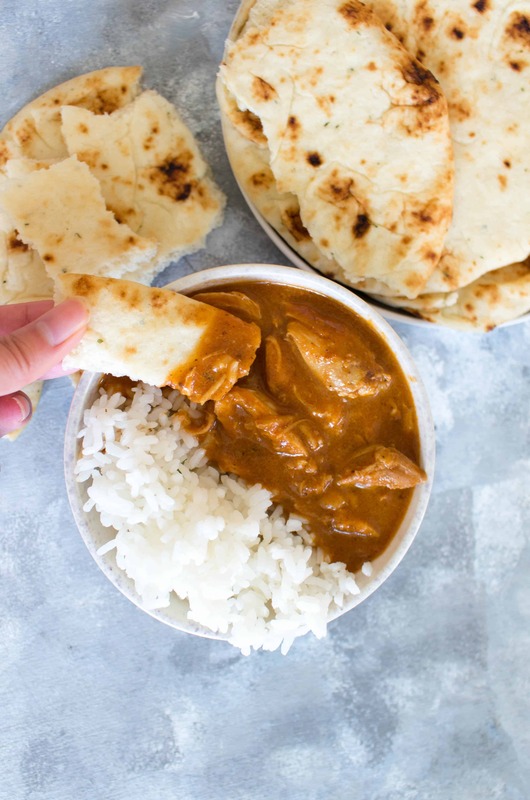 Click here to pin this Healthy Instant Pot Butter Chicken recipe for later! I love butter chicken. I grew up near Little India in the east end and to this day, I still go to the same restaurant whenever I’m craving comfort food. I almost always without fail order butter chicken and I love putting it over a plate of beef biryani. For ages I’ve wanted to try my hand at making my own but I’ll be the first to admit that I was a little intimidated but how Indian food then to be spice heavy and complicated. However, over the years of eating my weight in butter chicken and getting a lot more comfortable in the kitchen, I’ve gotten more confident in attempting to make butter chicken at home. Through a lot of trial and error, I think I’ve gotten the spices down and simplified it. I’ve never seen how “authentic” butter chicken is made and I’ve heard there is coal involved. Instead, I’m using an Instant Pot so not only is this butter chicken simple but it’s fast! How Simple Is Simple? How Is This Butter Chicken Healthy? I also used flour to thicken the sauce because to make this butter chicken healthier, I omitted whipping/heavy cream and used milk instead. I also used garlic paste instead of garlic to keep the sauce smooth. Other options instead of using heavy cream is to sub in with yogurt or use a food processor to blend raw cashews into a paste like consistency. 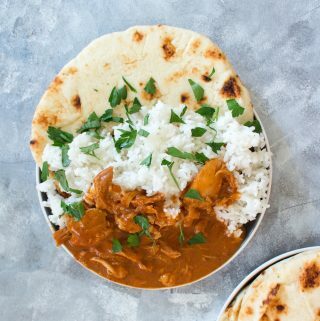 To make this Instant Pot Butter Chicken Whole30 compliant, you just need to swap out 2 ingredients! I have the Duo Plus 9 in 1 Instant Pot. The Duo Plus replaces 9 commonly used kitchen appliances – Pressure Cooker, Slow Cooker, Rice/Porridge Cooker, Yogurt Maker, Cake/Egg Maker, Sauté/Searing, Steam, Warm and Sterilize. It’s quite the multi-use product! That’s how I’m able to make butter chicken in less than 30 minutes! If you want to learn more about the Instant Pot and find more delicious and healthy Instant Pot recipes, here’s my What’s An Instant Pot post that also breaks down each model! On the sauté function of your Instant Pot, place in your garlic paste, tomato paste, spices, and passata and stir. After 2 minutes, mix in your chicken stock, and add your chicken. The liquid should cover your chicken. After the cycle is over, following the manufacturer's guide, open the lid. Switch the Instant Pot setting back to sauté and add in the milk (or coconut milk). On the sauté function, let it cook down for a couple minutes/simmer if it is not as thick as you'd like it yet. If the sauce isn't as thick as you'd like it (because we are not using heavy cream), in a small bowl, put 2 tbsp of flour and a scoop of the sauce and mix together until the flour as dissolved in. Add more liquid if needed. Once the sauce in the bowl has thickened, stir it back into your Instant Pot. If you are on Whole30, skip the flour/cornstarch method and just let the sauce simmer until thickened. *I've had feedback that the garam marsala is too strong but I've also had feedback that it was fine. Best I can say is use your best judgement. Add 1/3 to 1/2 first and when you QR to cook down the liquid, give it a taste and see if you need more before letting it simmer a bit. Let’s Chat! What is your go to comfort meal? Do you own an Instant Pot? Want more delicious and healthy Instant Pot recipes? Check these out! Want more simple chicken recipes? Check these out! Such a great recipe and easy too! Love, love, love it! This turned out delicious! Thanks so much. Tasted just as good without the cream! I need dinner ideas and totally forgot about the instapot. tHis recipe sounds very flavorful and super easy. We love butter chicken! What a fun and easy meal idea to try. I’ve never had butter chicken before. I will have to try to make this soon, it looks totally delicious. This didn’t not turn out well for us. 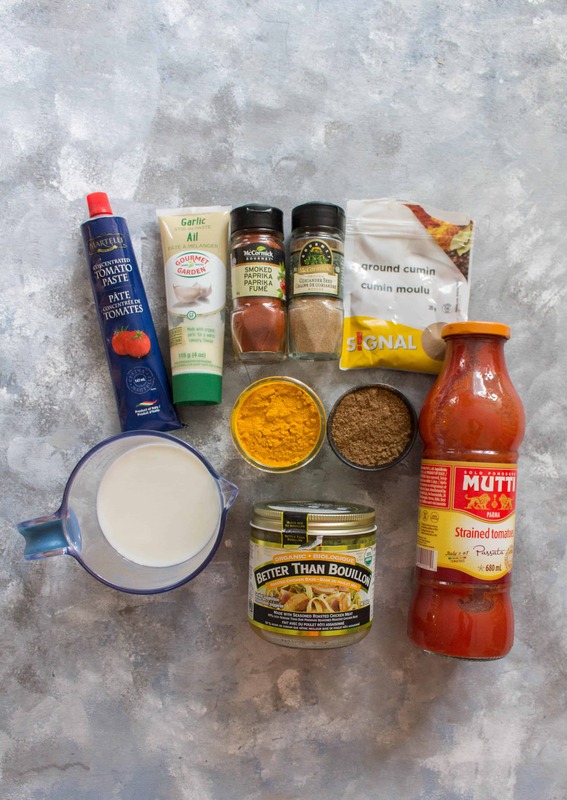 Is the measurement of 4.5 tablespoon correct for garam masala? The taste was very strong. I’m sorry to hear! I had a few other readers say they had enjoyed it and I personally enjoyed the flavour. I will add a note that the spice is to taste though. I appreciate the feedback! Are you cooking the chicken first then putting it in the pot or putting it in the pot raw and uncut? Hi Ann! SO happy that your family and you loved it! 🙂 It always makes me so happy to hear that. Thank you so much for the 5 stars. I used a 6 QT 9-in-1 Duo! Mine had just fit the 2lbs of chicken. I am quite possibly the only person on the planet who doesn’t have an Instant Pot — and at this point, it’s almost comical because everything is made in one. 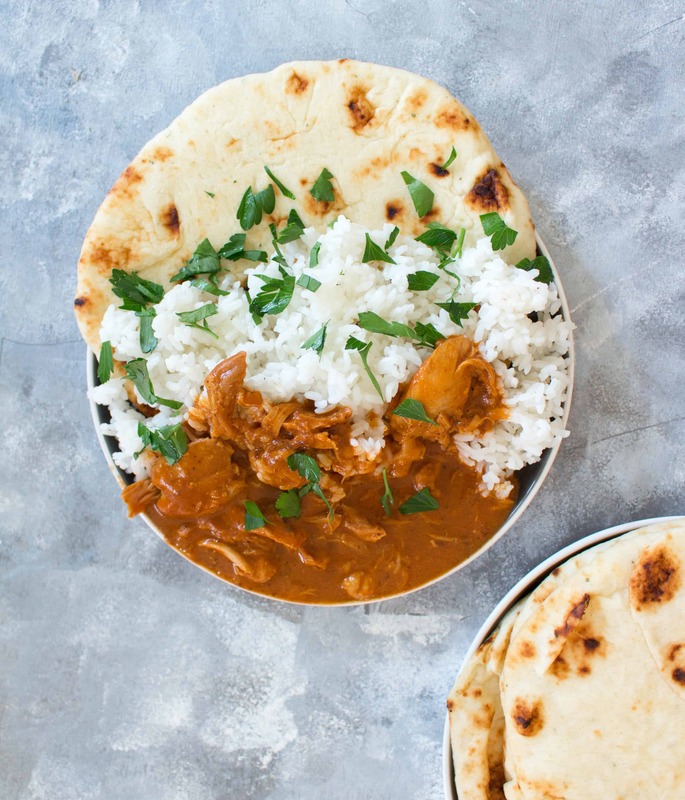 This butter chicken looks so rich and flavorful — and I love your tricks for lightening it up. This is definitely my kind of dinner. I LOVE butter chicken. This looks delicious. I do not have an Instant Pot, but a regular pressure cooker should do the trick. What a great dinner for have any night of the week. I know the family would love this. Butter Chicken is one of my faves too! This looks amazing and much easier than other recipes I have tried. Saving this for later, I don’t have an IP either so no, Lisa, you are not the only one in the World;P This is totally doable in a dutch oven I’m sure. I’ve never tasted butter chicken but it sounds amazing. I love sampling different cuisines. I don’t have an insta-pot. Could I use a slow cooker or even let it cook slowly in a Dutch Oven? I don’t plan on getting an Insta-pot – it’s one more thing I don’t have room for. 🙁 But I want to make this recipe so I will have to figure out how in the original version. Thanks for the inspiration and introduction to a new dish. I love making Indian food at home! (I have to make it at home, because I crave it daily lol.) 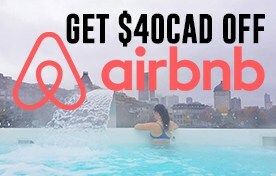 What a clever idea to make it in the IP- this sounds awesome! What a great dinner to make in the Instant Pot! This must smell so amazing when it’s cooking with those lovely spices. I can’t wait to scoop up that beautiful sauce with a piece of naan. So comforting. I also keep hearing about how great Better Than Bouillon is, but I haven’t tried it yet! Will pick some up the next time I’m at the market. That is some fantastic looking butter chicken! I just got my instant pot and will be making this next in it! I just love those big, comforting flavors of the rich sauce and the perfectly tender bites of chicken! 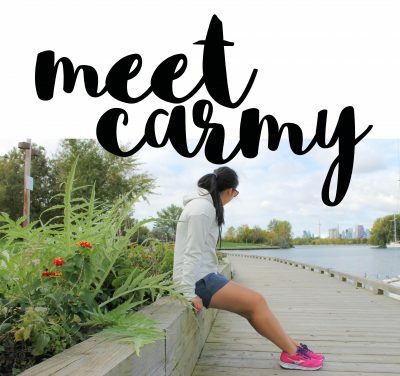 This looks oh-so-cozy and delicious, Carmy! And so great that it’s made in an InstantPot. These things are just magical cauldrons, aren’t they? I have pitas in my pantry right now. I wish I had some of this good stuff to dip into. I’ll have to figure out a pescetaria/vegetarian spin to put on it, but you’re almost sending me back to omnivore land with these photos, ha! I got an Instant Pot for Christmas and have only used it twice and I’ve never had butter chicken before so this is happening like ASAP. and it’s healthy?! I am SO adding this to my menu plan this week. I am in love with my instant pot, and I am literally craving all recipes I can find. This one looks INCREDIBLE! I love butter chicken anyway, but I hadn’t even thought of doing it in my IP. Guess I know what we are having for dinner. Our family LOVES this recipe . Amazing flavor and so easy to make 🙂 Thank you got sharing!